Choosing your wedding colors can certainly be a task within itself because you will be looking at them for the rest of your life. Your wedding pictures will be on the walls, in your photo albums, and even on your social media outlets. For inspiration we have compiled a guide to the hottest wedding colors! Go Nautical: This season its all about the nautical spirit. Infuse your color palette with the nautical theme by incorporating navy and white touches everywhere. From fashion to the tablecloths, you can find navy and white details to make your reception extra special! Metallics: Metallics can be found throughout fashion and your accessories and can be incredible when decorating for your wedding. You can mix and match gold and silver metallic colors and add a splash of color like magenta or plum for an unexpected twist. Navy, Navy, Navy: This season is all about navy. Navy is the new black, and can look great with almost any color. This season pair navy and magenta together for a fresh take on color, instead of magenta and black. Navy and orange make a great color combo, and navy looks great with just about anyone. Orange: Pantone Inc., the color authority, named Tangerine Tango the color of the year for 2012, and it is everywhere. 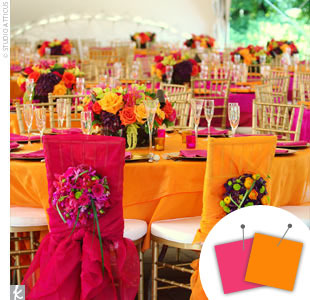 Infuse orange into your wedding for a fresh pop of color that will brighten your day! Mint Green: Mint green is a very popular color this season from fashion to shoes and everywhere in between. Pair mint green with pastels such as a blush pink and ivory for a soft look, or even navy for an excellent contrast. Other color trends include adding yellow for an added pop of color into your wedding colors as well as emerald and Kelly green. Cool grays and khaki colors are always a compliment to your wedding palette. So you have found the perfect dress, but its just missing a little something? Why not try adding a beaded or colored belt to give it that extra pop that it needs? 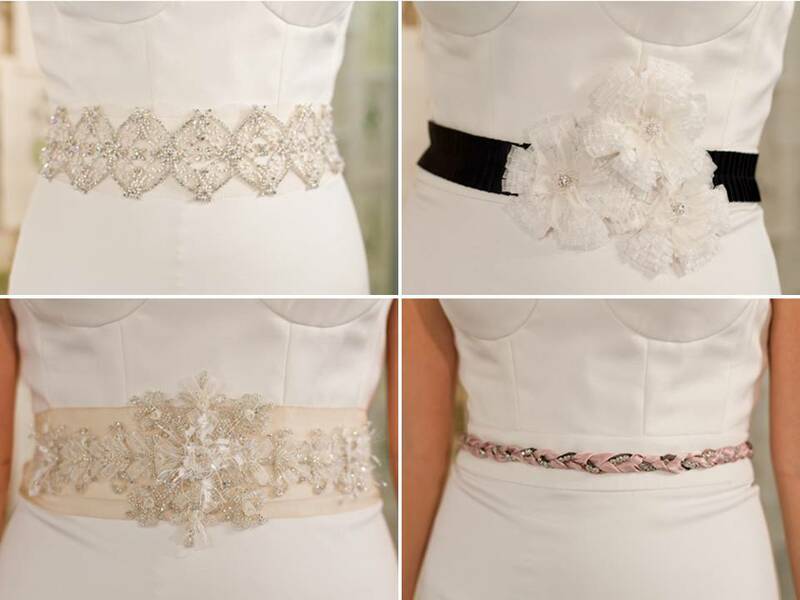 Belts add a lot to a gown, and with the right belt, it can take a simple dress and transform it into an amazing dress. Belts are the perfect opportunity to call attention to your small waistline. When you add a belt, your waistline instantly looks smaller, and you look fabulous. Consider adding a belt if you don’t think you have a waistline present, (you really do) and you will automatically have one! Belts come in various colors, and can compliment the dress really nicely. You can match your belt to the color of your wedding, or you can match it to the seasons. If you are having a December wedding, consider adding a red belt onto your wedding gown, to give a nod toward the season. This addition is always pretty on a gown. Belts can be just a simple piece of ribbon, to an elaborate piece of fabric. They can also have elaborate beading on them, or just a minimal type of beading. With the sparkle belt, you are adding just that much more sparkle to your day, which you can treasure forever. 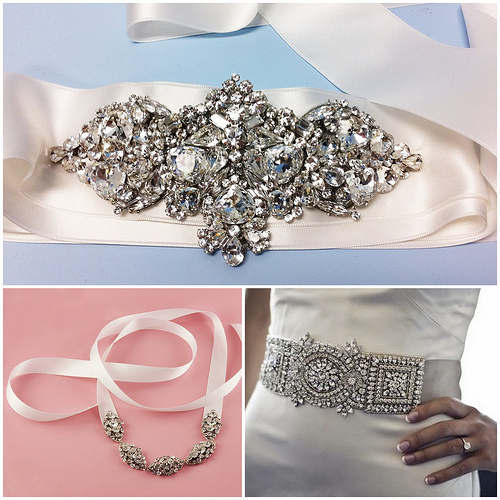 When ordering your wedding gown, ask if the belt is included, if not, you will have to order it separately. If you are ordering a belt separately, make sure you know how much the belt is going to cost. Depending on the style of the belt, you might find yourself spending more on that, than the dress. Blame it on Princess Kate, but lace is here to stay! Designers have caught onto the lace bandwagon, and have attached lace to just about anything they can! 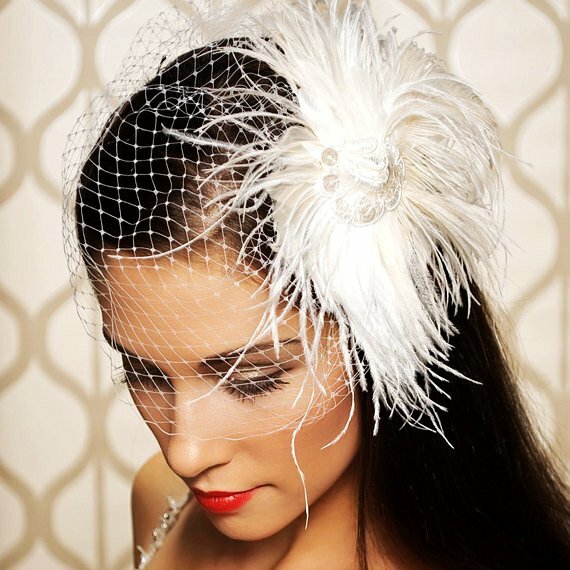 Lace is timeless and classic, and can look elegant coming down the aisle. You can find lace in just about any aspect of your wedding, and of course your wedding gown too! 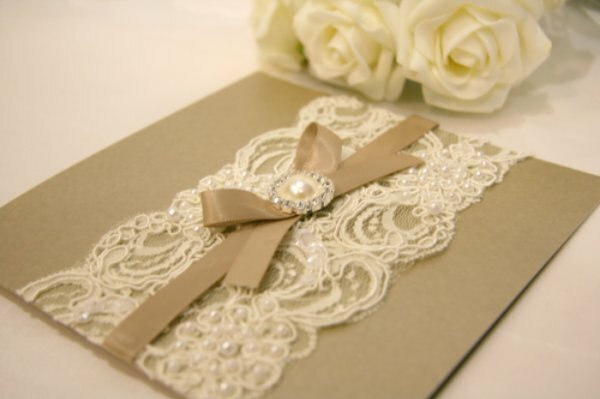 You can implement lace details in your bouquet, on your bridesmaids, your shoes, and even your tables. 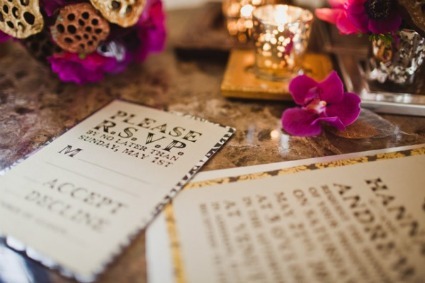 Lace table runners and table cloths are becoming very popular, so be on the lookout. 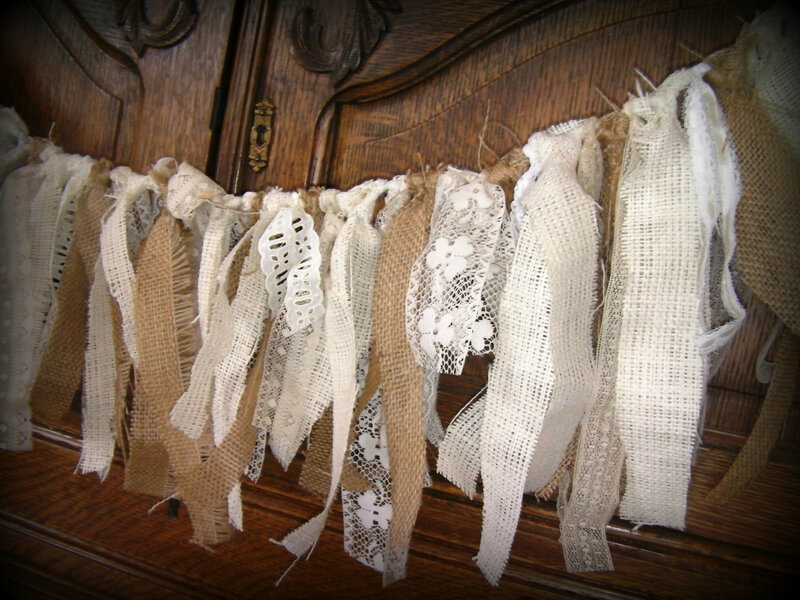 There are different types of lace, as well as different edging for the lace accents. Lace can be embellished with sequins, pearls or crystals, and will always look great. The most popular types of lace include: Chantilly, Alencon, and Spanish lace. There are many types of lace not listed, but equally as beautiful. In addition to the types of lace, you can also have lace appliqué which is applied to your gown, instead of a head to toe lace gown. Remember when dressing in lace, you want a smaller pattern, it will always look beautiful on you! If you have a more prominent pattern, it might bring about some flaws that you want to camouflage. Lace can come in different colors, but if you are using lace for your wedding gown, go for champagne, blush or black under the lace, as it will make the lace stand out a little more. The possibilities are endless. 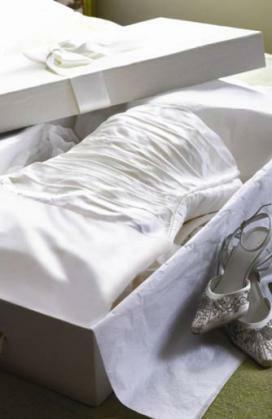 After your whirlwind of a wedding day, you might be thinking now what do I do with my wedding dress? Your wedding dress is the most important garment you will ever wear, and you want to take the appropriate steps to preserve your wedding gown for future use. If you have a daughter, this could be the perfect item to pass down to her, or you could simply preserve it to look pretty! In addition, you might consider preserving your bouquet, a beautiful way to remember your day! There are a couple ways to preserve your gown including sending it away for preservation by a local company. Most bridal boutiques will offer the service for a fee, and they might even send them out for you. In addition, you might consider preserving it for yourself, by framing it on a wall in your house. Although this might not be the norm, some brides are going to that extreme to preserve their memories. If you plan on having children, preserving your wedding gown is a sweet gesture that can be treasured for many years, and passed down. Another item that can be preserved from your wedding day is your bouquet. You probably put a lot of thought into what flowers you had in your bouquet, so preserving it is really the best option. Consider having your flowers professionally pressed in a frame for an interesting conversation piece to hang on your wall. Your flowers will look perfect forever! For a more three dimensional effect, consider having your bouquet professionally freeze dried and placed in a dome or shadow box. This will create a lasting memory for you.